First, an apology, even though it was supposed to be my second week last week I completely missed it, the only excuse I have is that I'm currently off work with flu, you'd think that would be fantastic for my blogging but in truth it's been a nightmare trying to get motivated whilst feeling so exhausted. Anyway, just thought you deserved a little explaination! I still owe everyone comments too, I'll make sure that I get those done by the end of the weekend. 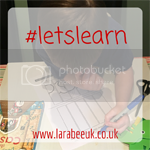 So, welcome to #LetsLearn, my weekly linky for all your learning blog posts, from early motor skills with babies and STEM activities to reading and writing for early years to GCSEs and beyond with your older children. You are welcome here at #LetsLearn. We all know that kids learn more through play and whilst they are playing they learn far more than sitting at a desk. I'd also really appreciate any social sharing or spreading the word about this new linky please, I really want it to be a success! The Linky is open right through until Sunday night.